Earlier today, I saw a tweet from Mental Floss about the home run derby. In fact, it wasn’t about the home run derby that happens the day before the Major League Baseball All-Star Game, no, it was about the home run derby TV show from back in the 1960s. After being reminded of the home run derby from the 60s, I wondered, can there be too much of a good thing? My first thought is, no! 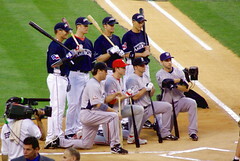 I love the home run derby, as do many other baseball fans. It’s a fantastical display of ability by some of the greater sluggers. There’ve been quite a few memorably home run derbies. There was Cal Ripken, Jr. in 1991. He hit 7 more HRs than the second place hitter. This was particularly memorable for me because it took place in Toronto (my hometown). There was also Josh Hamilton from 2008 when he broke the record for most HRs in one round, but went on to lose the home run derby. There was also Ken Griffey, Jr. in the last 90s. He won back-to-back home run derbies in 1998 and 1999. He still has one of the sweetest swings in the history of the game. Then, as I thought more about it, maybe seeing the home run derby once a week would begin to take some of the shine off of the event. Maybe if the home run derby happened once a week, we wouldn’t have the once a year, mid-summer classic, to look forward to for the display of towering home runs. Thinking about this also made me think about the slam dunk contest. It’s one of my favorite parts about the NBA all-star game. Watching the creativity of some of the best “slam dunkers” is really entertaining. If there were a slam dunk contest every week, would that be too much? Other than actually producing the show, there’d be no way to know (for sure). If I had to hazard a guess, my guess is that it would be too much. Part of the fun of the home run derby and the slam dunk contest is that it only happens once a year. The amazing feats of ability are rare (at least in their display in this context). And that rarity also adds to the fun of the event. We know that at the end of the night, we won’t be seeing the feats again for another year.